A very big congratulations to Adrienne and Robert Hodgson with your amazing colt “CP SURELY THE BEST”. What a magnificent colt he has grown into! Bred in the Purple - By one of the best USA performance producing sires RL BEST OF SUDDEN from Coronation Parks great mare SURE A PRETTY BLAZE. 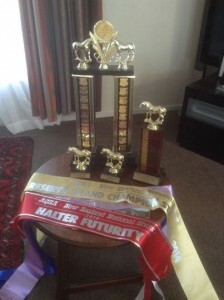 We are so “Very Proud” of your achievements under the ever watchful eye of the great horseman Mark Chamberlin. CP SURELY THE BEST was also Champion Yearling colt in both the NZ and USA colt catogories and Reserve Champion in the Yearling On The Lunge. We so look forward to watching Mark progress this beautiful colt and making him a champion under saddle! No doubt he will make this colt an outstanding performer true to the tradition of this family of the incredible Schroeder Ranch Champion Broodmare “MISS SURELY BARS”.